There can’t be a better poster child for back room sleazy deals and elitist government than Ben Bernanke. Stubbornly sticking to his position that the U.S. Congress and the people can’t handle the truth about who has their hands in the people’s cookie jar has got him into some trouble from all parts of the political spectrum. Unfortunately not enough trouble to prevent another 7 years his mismanagement and corruption. First, to those who argue that he prevented an even worse disaster – it’s impossible to prove that one way or the other so it amounts to your opinion. And it’s an opinion with no evidence to support it – and tons of evidence to the contrary. I’ll be glad to debate that in another blog but in this one I want to look at the votes. This vote was not overwhelmingly partisan. The Dems and the GOP both sold you out. It’s no surprise that Vermont’s Bernie Sanders voted no. He’s been a critic Bernanke and a supporter of transparency. Connecticut’s Lieberman is the ID (Independent Democrat) voting Yes. 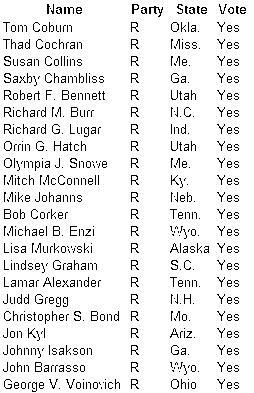 For those of you who cling to the idea that the Republicans are our best hope for freedom might want to note that 22 Republicans voted for the Shadow Government. Here is the list. Here is the list of those who voted Yes and who are coming up for re-election this year. There are 12 Democrats and 8 Republicans. Let’s defeat them all. As consolation to the Republicans that would reduce the Dem’s’ majority.